10 April 2018, Dubai – Guinness World Records™, the global authority on record-breaking, today announces that Japan's Masazo NONAKA is the world's Oldest living man at 112 years, and, as of today, 259 days old. 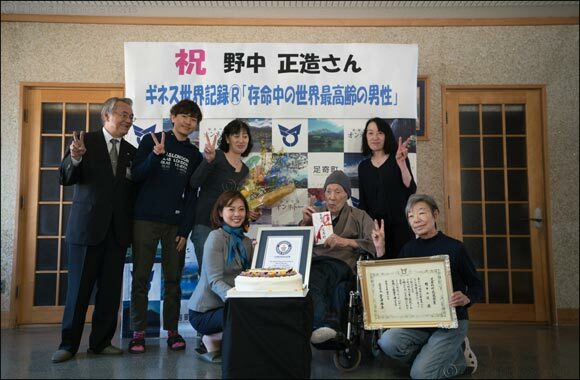 Mr. Nonaka was presented with the official certificate today in his home town of Hoikkaido Japan by Erika Ogawa, VP Japan for Guinness World Records. Mr. Nonaka took the title after Mr. Francisco Nuñez Olivera (Spain, b. 13 Dec 1904) unfortunately passed away on 29th January 2018 aged 113 years and 47 days. Mr. Nonaka was born on July 25th, 1905 and is the eldest son of eight siblings. He has 7 brothers and 1 sister in Ashoro, Hokkaido. He married Hatsuno in 1931, and is father to five children (two boys and three girls). Currently he enjoys watching TV and reading newspapers and lives at home with his family. He likes to indulge in sweets and cakes and enjoys hot springs in his families B&B. Guinness World Records are currently investigating the title for the Oldest person living, and the Oldest woman living. Further information will be announced upon confirmation of the next record holder. The oldest person ever to have lived was Jeanne Louise Calment (France) who lived to 122 years and 164 days.